Death of a Pancreas: Merry Christmas to all and to all a good night! What a sweet family you have, Joanne. Merry Christmas and thank you for all of your help these last few months! I heart you and your awesome sense of humor Jo!!! Have a great day with your family. What a beautiful family picture! Merry Christmas!!! Beautiful. Family! Hope your day was super special! Merry Christmas!! I hope you all had a wonderful and happy day. Merry Christmas!!! What a beautiful picture...I love it! I hope that your day was filled with many blessings and a whole lot of joy!!! I love the family picture! Merry Christmas to you too! Okay .... am I the only one who had to search for Seven? Hehe. If it weren't for his white muzzle I would have missed him completely! 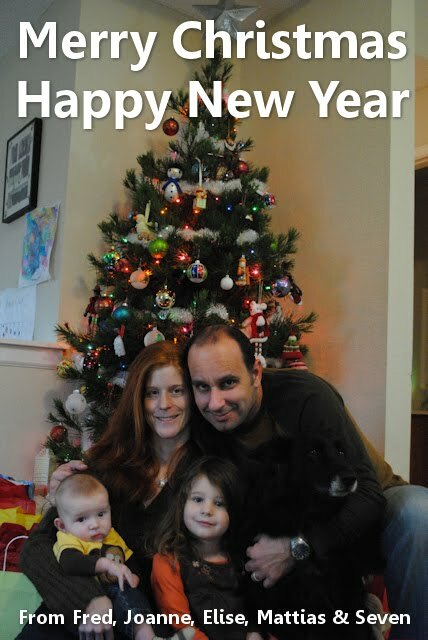 Lovely card and a lovlier family, my friend. Merry Christmas!!! !